THE PICKIEST EATER IN THE WORLD: HAIL TO THE KING CHEF, BABY! 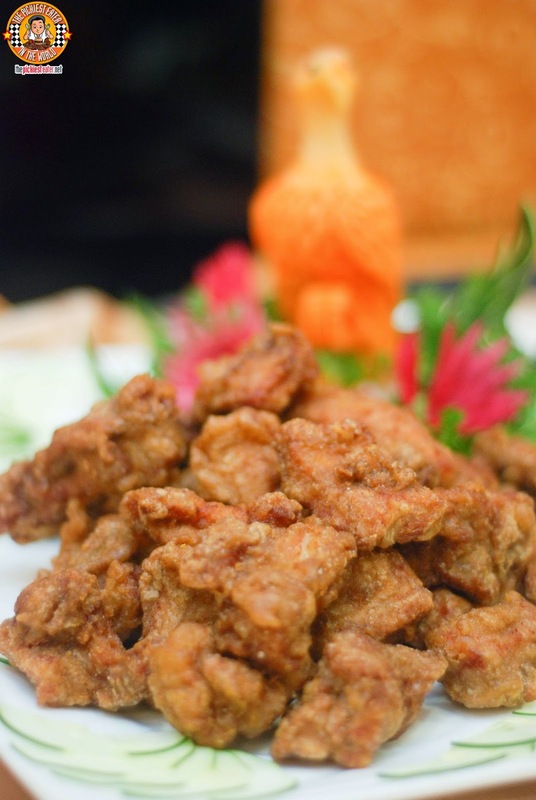 I've declared my love for Chinese food time and time again in this blog. My food blogger friends have been wanting to go on a Binondo Food Trip around for quite some time now, but we've never had the time. I have to admit that I am totally clueless around the Manila area. If you asked me right now how to get there, I wouldn't know where to start. I know there is a treasure trove of Chinese restaurants in the area just waiting to be discovered, which is why I've always had the area in my cross hairs. 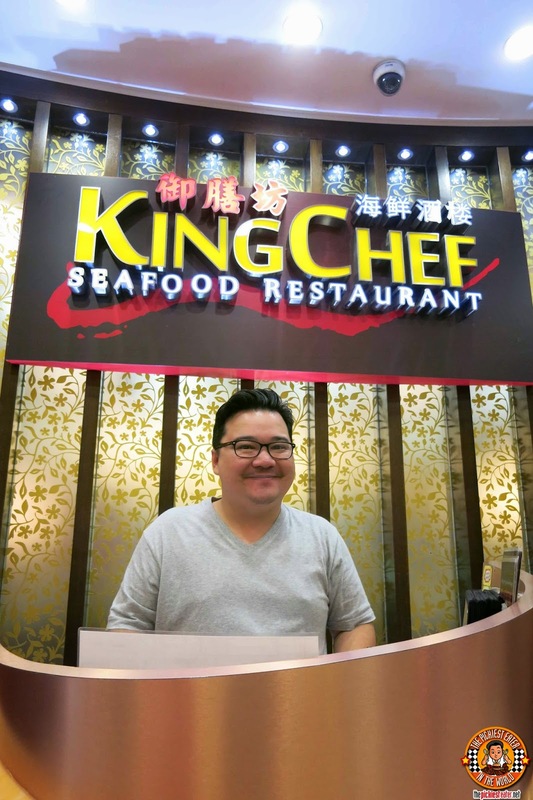 I felt a good place to start would be King Chef Seafood Restaurant at Lucky Chinatown Mall. From their humble beginnings with their first venture, Cantonese Soup Kitchen, owners Michael and Marites Ang watched their restaurant business rapidly grow. From the success of Cantonese Soup Kitchen, the couple opened King Chef Dimsum Kitchen, which also became a hit with the Chinese food loving public, requiring them to move to a larger location, which eventually became King Chef Fine Dining Restaurant at Banawe Street at Quezon City. In 2012, The Angs decided to take King Chef to conquer a new kingdom - Binondo, an area known for some of the best Chinese Restaurants in the country. Despite the fierce competition around, King Chef continues to stand tall today. Since it's located in a Mall, King Chef isn't exactly the "Hole-in-The-Wall" I was looking for when I imagined what my Manila food trip would look like. In fact, it was far from it. 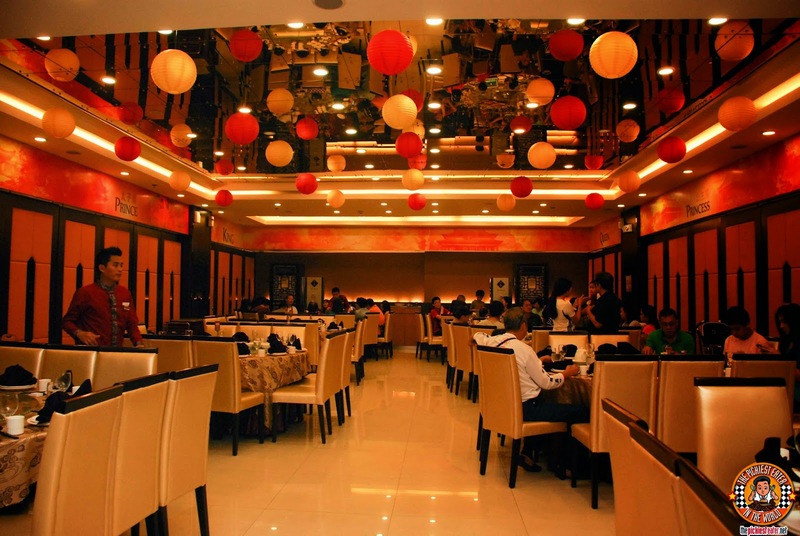 King Chef's interiors invokes the classic, luxurious feel that some of the best Chinese restaurants. I was really excited for what King Chef was about to offer, and my friend, Spanky, told me to expect a whole lot more than just your run of the mill Sweet and Sour Pork and spring rolls. The very first platter that was brought to our table was a reaffirmation of what Spanky was trying to tell me. I couldn't really make out what it was at first, but the presentation, adorned with a small carved dragon, made me feel like it was perhaps the most majestic platter of food I had ever seen. The glorious looking platter turned out to be King Chef's Baked Seafood Apple. 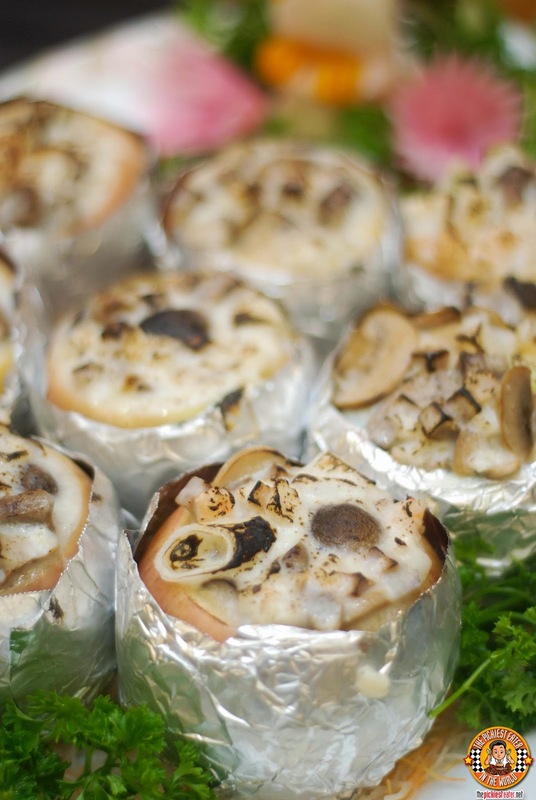 A plump apple is hollowed out, and filled with a combination of shrimp, squid, fish, mushrooms and taro, then filled with a creamy coconut milk, before being baked. Can you imagine all those ingredients being baked inside an apple, letting the fruity sweetness seep into it and the coconut milk? A testament to how good it is? Half the stuff in it.. I don't usually eat. But I absolutely annihilated my apple, like my name was Adam. I was a little bit on the fence when I was told that the soup in front of me was Shark's Fin with Chicken Soup. I'm against the use of Shark's Fin in food, since Gordon Ramsay brought it to my attention. But at the same time, i wanted to see what was the fuss all about.. Does the Shark's fin make a difference in the flavor? The answer, in my opinion, is .. The Sharks fin itself? No. It actually doesn't taste like anything. But on the whole, the broth had the pronounced flavor of chicken and the slices of ham helped add to the meatiness. A stalk of Bokchoy is added as well. Very good soup, but I think the Shark's fin is totally unnecessary. Even if it did add flavor to the broth, I'm should it would still be pretty tasty without it. As soon as Rina saw them bringing the platter of Crystal Prawn Balls to our table, she whispered to me, "Akin nalang yung share mo, ha?" (Your share is mine, ok?). This was sauteed prawn balls, laying on a bed of shredded leeks and bell peppers,a nd eaten with Chinese Bagoong (Shrimp Paste). As I watched Rina wolf down my share, It occurred to me that I had no idea that Prawns had balls, let alone Crystal ones (Ba dum dum tssh). I got an incredulous look from Rina when I tried to tell her "Akin nalang share mo, ha?" when they brought out the Garlic Burst Spareribs. Apparently this only applies to her. This was remarkably tender spareribs, that maintained its juiciness even after being deep fried. The dish is so aptly named because the spareribs simply burst with flavors of garlic, without being too overpowering. Me and my buddy, J, made sure that this entire platter was wiped out. The next table's too. This was the first of my two favorites of the meal. The next dish brought out was a vegetarian dish.. Braised Bamboo Pith with 2 Kinds Mushroom. 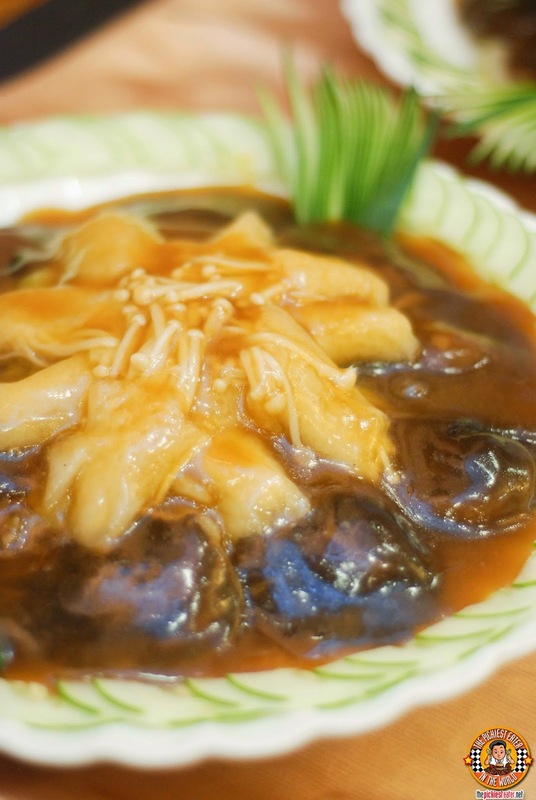 A Bamboo pith is stuffed with enoki mushrooms and Black Mushrooms, and smothered in a thick oyster sauce. Since it was a vegetarian, I was planning on skipping this, but the oohs and aahs coming from my food blogger friends after one bite got me curious. I'm actually ok with Enoki mushrooms, and the combination of that with the oyster sauce made me forget (for a split second) that I was eating a vegetarian dish. This actually is quite deceiving because it may seem like a simple veggie dish, but it is quite filling. How surprised would you be if I told you that the second dish that I loved at King Chef was the Stuffed Eggplant in Japanese Sauce? For some reason, I couldn't resist this platter of whole eggplants, delicately stuffed with a shrimp ball like mixture, then coated in a light batter and deep fried to a perfect golden brown. The eggplants are then bathed in a "Japanese Sauce", whose complex flavors took your taste buds on a salty & sweet ride. More than anything, it was the crispy eggplant with the sauce that I enjoyed.. Even without the shrimp filling.. It was fantastic. 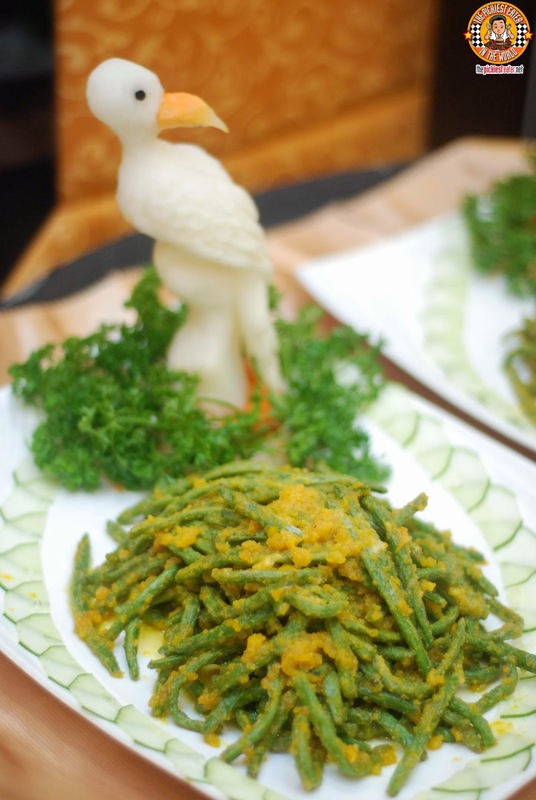 Another vegetable dish that they brought to our table was the French Beans with Salted Egg. I'm surprisingly ok with beans, and the melted salted egg yolk added an interesting touch of flavor to it. 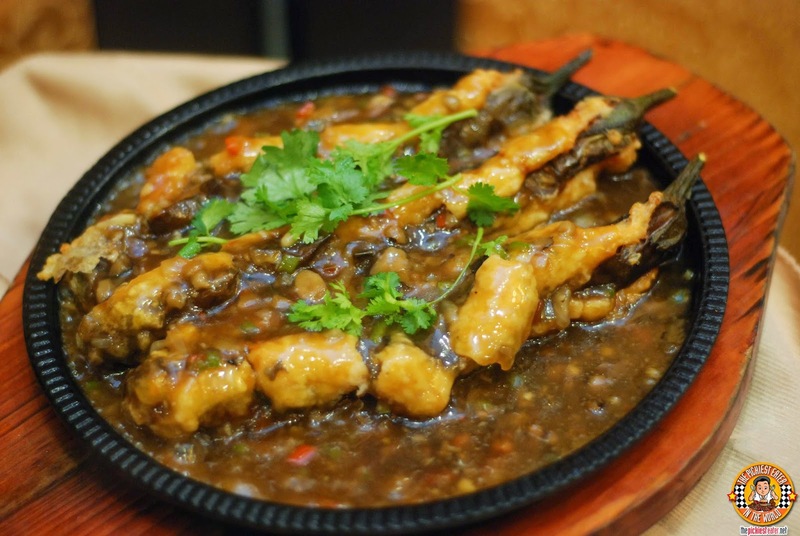 The dish that helped the Ang's rise into successful restauranteurs, is the Satay Seafood Sotanghon in Hotpot. 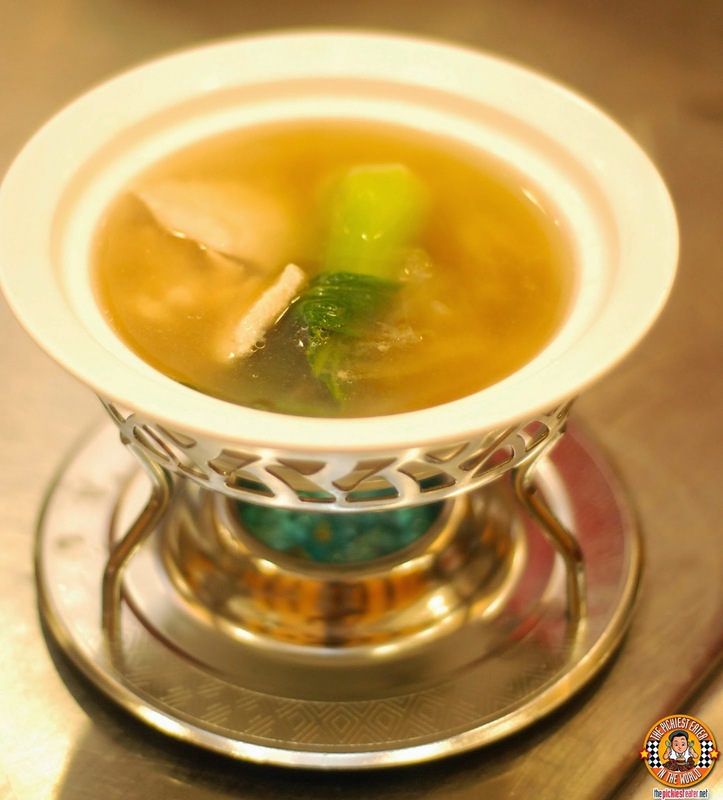 This was the most requested dish of Cantonese Soup Kitchen, and was instrumental in stamping its claim as one of the top Chinese Restaurants around. The demand remains strong even today at King Chef. 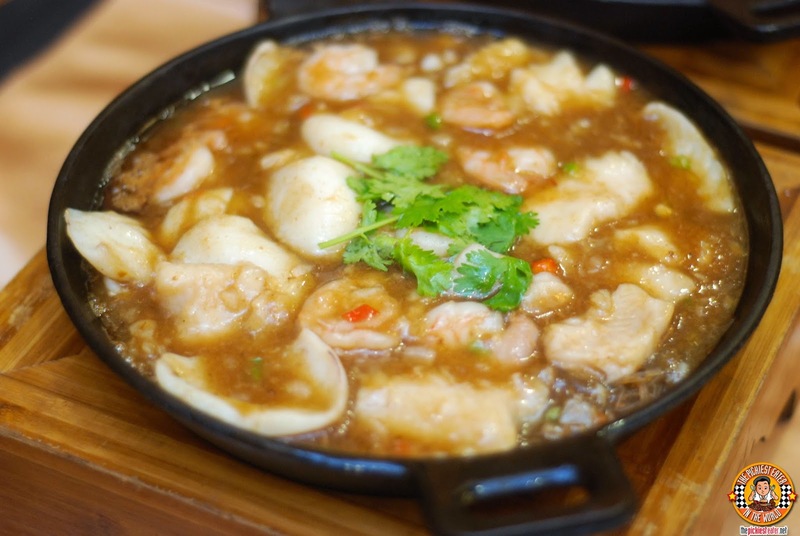 The delectable combination of plump and juicy shrimps, squid, and fish fillet in mildly spicy satay sauce, poured over thin glass noodles, simmering in a steaming hotpot. 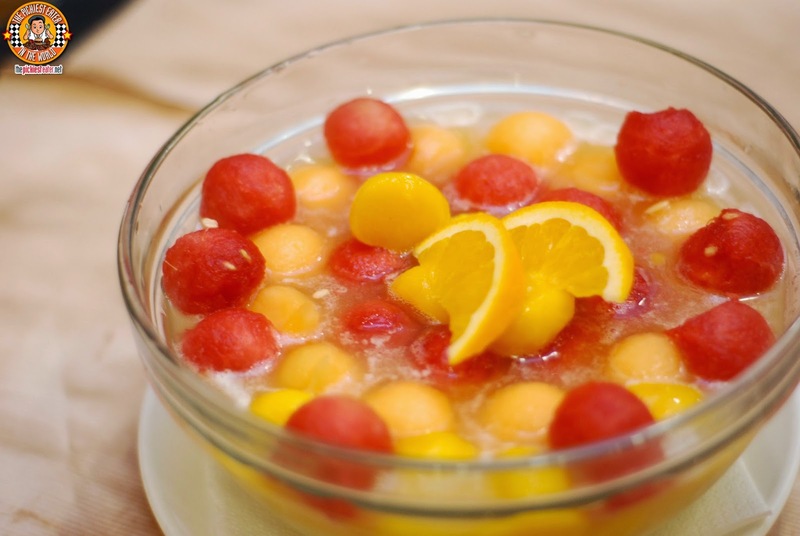 For dessert, they brought out the Fruit Burst, which was an assortment of fresh tropical fruits, namely watermelon, mango, melon with fruit jelly balls, in a fruity citrus base with crushed ice. The fruit jelly balls were delightfully refreshing, and a great palate cleanser. It was a wonderful way to cap off a meal that was filled with an assortment of bold flavors. 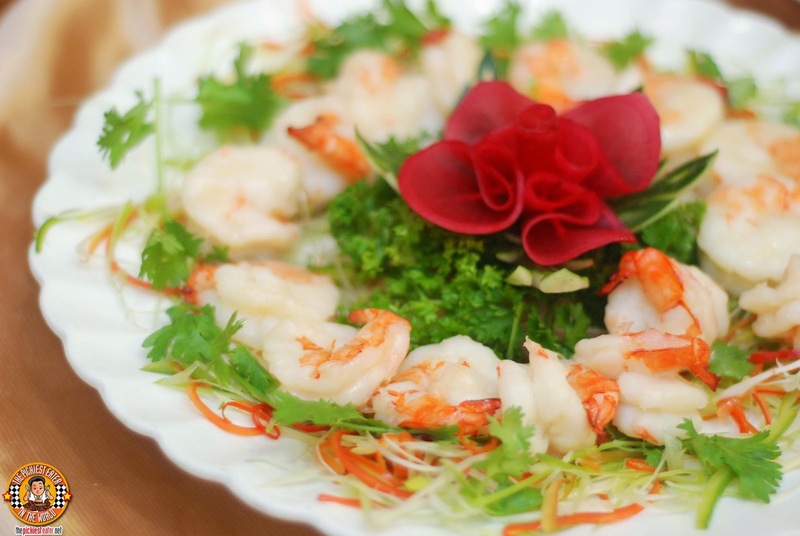 King Chef took me through a gastronomical journey through the wonders of the Chinese Cuisine, and I loved every twist on turn it took me on! I'm excited to go back and try their other dishes! The stuffed apple looks great.It had a nice brown color to it, i wonder how it tasted like (probably good since you 'annihilated' it) hahaha! 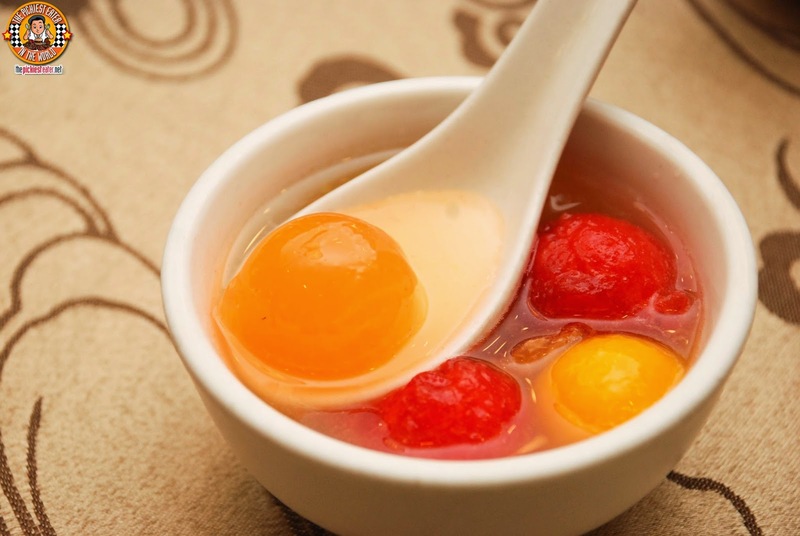 the fruit desserts is a surprise, its the first time i have seen a chinese restaurant serving a fruit dessert like that! easy to eat! love chinese food(: thanks for this post..